Road Trail Run: New Balance Fresh Foam 1080v9 In Depth Review: a Major Update Gets the Lead Out and Smooths the Ride! New Balance Fresh Foam 1080v9 In Depth Review: a Major Update Gets the Lead Out and Smooths the Ride! Our initial review is now updated after full testing by three of us. given the 1080 a superb Jacquard mesh with one piece molded rear heel unit modern upper. So much of an improvement that I cut my side by side test with v8 short as the contrast was so striking and the v8 so ponderous and stiff in comparison that I put two v9 on my feet to carry on! Much improved, the v9 is a major update. Jeff: “New Balance’s design team deserves a raise,” was my immediate reaction. On the surface, the 1080v9 is a few clicks of the slider away from the v8 (especially when you have the black and white colorway of both shoes), and a casual observer wouldn’t be able to tell them apart. But everything about the shoe has changed, upper, midsole, outsole, and none of the changes feel like a minor evolution - this is a serious change. The fit is spot on true to size, and while I considered going with the 2E model, I stuck with the standard D and have no complaints whatsoever. $150. Available now including in 2E Wide. Sam: Of course the upper and its fit are always vital and here New Balance made big changes. NB dumped the conventional engineered mesh with many overlays and plastic bits for engineered jacquard mesh with no overlays and a single piece molded heel area. The v9 is a much sleeker looking and has a notably more of a piece performance oriented fit for me. Essentially this is a two piece upper: rear molded piece and front jacquard mesh. The "N" is reflective. The fit is smooth and "barrier free" and overlay free from the second lace forward. In fact, from the rear lace up forward if one doesn't count the functional N logo, there are zero overlays with support from the varying density of the mesh and the N. The overlays near the metatarsals are gone. The v9 has a beautiful all serious business, firmly padded single piece molded 3D heel unit and lightly padded non bootie tongue. The puffy tongue of the v8 is replaced by a more thinly padded one which meshes just right with the non stretch laces, what looks like a glue infused denser rear of the jacquard mesh and the "N" all combine to provide a secure and pressure free fit. Sam: The fit is true to size with some stretch to the upper and plenty of foot splay for me. Those who need for width can go for the available 2E wide version. Jeff: The 1080v8 to 1080v9 transformation is striking. While the v8 felt like a lumbering shoe that had come together on its own more than actually having a design team behind it, the v9 feels like the result of a design philosophy that only improved everything. The v8 toe box is slightly wider, and as a wide toe box convert who champions Altra and Topo for their efforts, the v9 upper is accommodating in a way that never made me wish there was more room. The upper definitely betrays the shoe trying to hide as a slow daily trainer. Daily trainer, sure, but not slow at all. My only gripe, and it is minor, is the how the heel holds my foot. I don’t experience heel slip, ever. My foot has enough volume that virtually every running shoe I’ve put on hold my foot in place. Sure, some shoes aren’t locked down enough for me to run technical trails in with some confidence, but I’ve never needed to use a runner’s loop to keep the shoe in place. All that said, once I did re-lace the shoe with a runner’s loop the heel slip ended, and my complaint went away. Nothing that should disqualify the shoe by any reach, but an interesting tidbit. Hope: I hadn’t run in the 1080 since the uninspiring v6. The v9 breathes new life into the line. I got some Pegasus 35 vibes from the upper. There’s no heel flare in the 1080v9 and it offers a more high-volume fit, but it’s hard to deny the similarities in the jacquard mesh and the decorative pattern, executed more subtly in the 1080v9. New Balance makes some nice-looking shoes and the 1080v9 is no exception. I’m happy with the upper fit from the midfoot foward. Midfoot lockdown is adequate, but hard to appreciate because neither the heel collar nor the heel cup holds my Achilles or heel well. Like Jeff, heel slip isn’t ordinarily an issue for me. The heel piece of the 1080v9 has a lot in common with the heel collar of the original Under Armour Gemini: it’s smooth and molded like a bra cup, but lacks the Gemini’s plastic clip that kept my foot in place. The 1080v9’s midsole sidewalls extend up high in the heel, but don’t noticeably contribute to heel hold. With a more secure heel collar, the extended midsole could provide a bucket seat-like feel. As it is now, the collar is so wide and unsupportive that not even heel lock lacing improved the heel hold for me. There’s noticeable slop with every footfall. In NB’s defense, this is the men’s version and the women’s version might have had a better chance of fitting in the heel. I’ve had exclusively men’s versions of NB shoes across six models including the 1080 for the last several years, so I didn’t expect any fit issues. The heel slip doesn’t ruin the shoe for me (not even close! ), but if you’re worried about it, consider trying these on before committing. Sam: We'll discuss the outsole before the midsole as for me the most significant changes are to the flow and transition as well as feel of the outsole. Underfoot we still have a dense array of full coverage rubber. I was worried that the v9 would be stiff as its predecessors were. Not so! The blown rubber lozenges are smaller and softer, providing a softer feel and more deflection and flex with different foot strikes and instead of two flex grooves and smaller cuts we now have five including one near the mid foot. The result of these outsole changes is apparent on the run. Instead of having a very stiff single forward flex point as the v8 had, the v9 has a longer easier flex for suited to a trainer. OK, not a super easy flex but a much easier to transition one at all paces. The heel retains firmer rubber. Jeff: I agree with Sam 100%. The v9 outsole is very close visually to its predecessor, but the resulting run is very different. The rubber doesn’t look any thinner than the v8, and there’s every bit as much coverage, but those five slits in the mid to forefoot have to help the shoe’s flexibility, and in doing so, help the shoe in how it runs. I suspect the main culprit is the difference in midsole, but the massive rubber coating made the v8 feel like a block underneath the foot, and the v9 bears no resemblance whatsoever to that. Hope: The outsole rubber is thick, but it’s not overly firm. It’s soft enough and flexible enough to play well with the Fresh Foam. I noticed an alarming amount of wear after my first run in the 1080v9 (subsequent runs haven’t resulted in quite that much visible wear), so I’m pretty glad to have a thick slab of it to burn through as I plan to put a lot more miles on these. 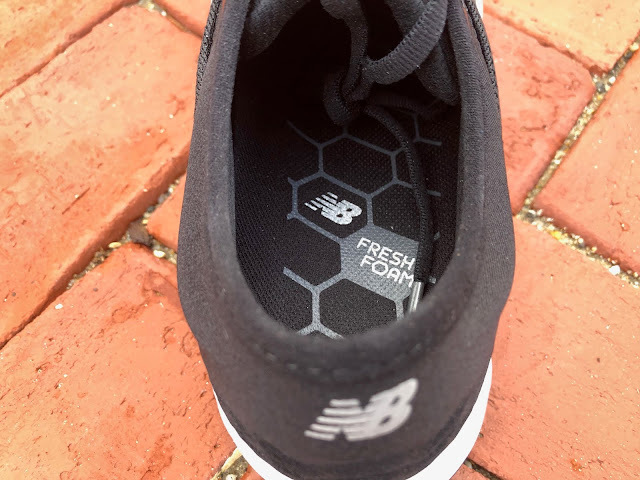 Sam: New Balance says the Fresh Foam midsole is a bit softer and I noted this on the run one of each version on each foot. The lateral side has deeper laser cut grooves softening landings a touch. The forefoot feel is notably less harsh. I also feel the geometry at mid foot is more streamlined less blocky, likely a combination of the Fresh Foam hexagon geometry and more sculpted less vertical side walls on the lateral side. Jeff: I am not convinced that the v9 midsole material is the same as the v8, they feel that differently. At Sam’s suggestion I spent the last several miles of a run with the v8 on one foot and the v9 on the other (unlike Sam I spent 2.5 miles mixing it up) and if I didn’t know differently I would have thought they were a completely different shoe or even a different manufacturer. The cuts in the Fresh Foam work wonders, and like its sister shoe New Balance Beacon, it finally brings a softness that the original Fresh Foam shoe promised. When I put the v9 back on my right foot, for a cool down, I was taken aback at how much more cushioning the newer version had, and at the same time how much more firm it was. For me, New Balance just set the bar for the right balance between soft/cushioned and firm/responsive. Hope: Fresh Foam finally done right! The 1080v9 midsole is outstanding. Cushioning is smooth, consistent, and firm enough to go fast. Effortlessly dipping down to the mid-7:00s is a big deal for me in any circumstance, especially in a shoe of this weight. This is what I was hoping for from the original Fresh Foam shoe all those years ago. It’s fair to say that I’m obsessed. The midsole is so improved that this is hardly recognizable to me as a model in the 1080 line. Sam: What a difference! When lower weight is combined with slightly softer midsole and much improved forefoot flex and front cushion. the 1080v8 now competes with classic daily trainers such as the Pegasus 35 (firmer, stiffer and duller forefoot, snugger upper), Ride ISO ( loose upper with a slightly more agile ride), and Ghost 11 (slightly softer heel and similar upper), and Skechers GoRun Ride 7 (bouncier and livelier and less stable). The ride is moderately lively in a densely protective way and for sure is no longer harsh, stiff and ponderous. The heel is a touch blocky. I wonder what this shoe would feel like at a 6mm drop instead of 8mm. I bet livelier yet. All paces are welcome here, the sub 10 oz weight gets the lead out, but this is not one of those lively new age bouncy rides. It is for sure a stable ride in neutral trainer. While a neutral shoe there is still plenty of stability here most notably at the heel and forefoot.To date it has provided a dependable, and durable kind of ride, one that I clearly see will getting runners through many miles of training at most all moderate paces on the way to a marathon. Jeff: The midsole may have increased softness, but it’s not a slow or sluggish shoe. New Balance has effectively changed what shoes it compares to by the way that it runs, and that’s a great thing. For years it would match up directly with the Saucony Triumph, Brooks Glycerin, or Nike Vomero, but this shoe feels different. While the latest Triumph is a massive step forward, it remains a heavy duty daily trainer that wouldn’t be anything I’d consider racing in, and the 1080v9 would be a frontrunner for a half-marathon for me. Sam’s right, it isn’t bouncy, but it works well at fast and slow paces. I spent a mile in the v9 around my 5k pace, and it felt great. No hot spots or numbness that were hallmarks of running in the v8 too quickly. Hope: The ride of the 1080v9 reminds me of a Zante v1 on steroids. The toe spring is less aggressive and there’s the heel hold issue I mentioned, but the 1080v9 runs smooth and feels like a much lighter shoe. I agree with Sam and Jeff: its peer group has shifted away from premium everyday trainers to nimbler uptempo trainers. At long last, the 1080 moves towards the front of the daily trainer class and away, at just under 10 oz, from the plush heavier "premium" trainers such as the Saucony Triumph ISO5, Asics GEL Nimbus, Brooks Levitate and Glycerin where it used to hang out. It joins the daily trainer class of about 10 oz shoes inhabited by shoes such as the Nike Pegasus, Saucony Ride ISO, Skechers Ride 7 and Brooks Ghost. With the 1080v9 we now have a fine fitting, more performance oriented upper with plenty of room and comfort, lots of dense now softer protective cushion underfoot and at long last some flexibility and get up and go! While vastly improved all around the outsole's full coverage contributes to weight and could be slimmed down in non high wear areas. The 1080v9 is probably my biggest surprise shoe of the year. Visually it is a minor makeover from the previous version, but it isn’t burdened with any of that shoe’s shortcomings. The v9 can be an all-purpose shoe for most runners, handling virtually any type of run you can throw at it. It is still far more shoe than most runners would want for a 5K to 10K, but it could be the mainstay of your training leading into the race. The upper is stretchy, but holds the foot, the outsole is durable, but allows for a fair amount of flex, and the midsole is firm and responsive while still providing comfort and protection. -.05 for showing me what heel slip is, even if it can be cured with a runner’s loop. The 1080v9 surprised me too. I was expecting another overbuilt, inflexible tank like the v6, so I was thrilled to find a lively, responsive ride that belied the shoe’s weight. Fix the heel hold issue and this would be basically the perfect trainer. As it is, I still really, really like it. I might even consider racing 13.1 and beyond in the 1080v9. It’s definitely suitable for long training miles and some faster efforts. Still a new favorite of mine. Jeff: This isn’t a comparison. The v9 is better in every way, which is why it will be a longterm mainstay in my rotation and the v8 graduated to casual wear within the first 25 miles. Lighter, softer, faster, more comfortable, you can choose whatever superlatives you like - the v9 is better. Sam: The v8 is firmer, stiffer, and heavier. While these shoes share a model name they run very differently. Clear nod to v9. Sam: The Pegasus 35 in some ways reminds me of the 1080v8 with a stiffer forefoot and more awkward transition than the somewhat heavier 1080v9. I would say the firmer Peg has a slightly more responsive if considerably more lumpy awkward ride than v9. Jeff: The 1080v9 is what the Pegasus Turbo was trying for. Soft and responsive, a great training shoe that some would use for a race - except the 1080 delivered every bit of that better. While the Turbo uses Nike’s top tier ZoomX foam for part/most of its midsole, the 1080 still wins in running feel, as well as is the no-brainer win for durability. The 1080 is also far more comfortable, with a toe box made for lots of miles. Hope: Jeff said this exactly right. The 1080v9 has less of a soft feel underfoot, but seems equally cushioned and protective. Its superior ground feel and greater outsole coverage make for a more responsive ride that’s way more fun. For me, the 1080v9 is also the faster shoe. Sam: Can't add to much beyond saying that the Turbo is not particularly stable in comparison to the 1080 or for that matter most other trainers. It's soft thin forefoot is fun to run...for a while... It's upper is warmer and the sharp racing stripe a toe bother. Jeff: These two shoes line up surprisingly close to each other. Weight-wise they are a quarter ounce apart (not that it matters, but the 1080 is lighter), both of them have plenty of cushioning, very similar ride, more flexibility than you would anticipate with that much rubber on the outsole, and a nicely fit upper. No surprise that the Topo has more toe box space than the 1080, but that's not a failing of New Balance. I'm a coin flip between these two fantastic shoes. However, if you want to push pace or prefer a more subdued look (compared to the bright orange UltraFly 2) I'd give the slight edge to the 1080. If you want massive amount of toe room, you prefer a flatter drop, or you're looking for a trail hybrid (the UF2 is amazing on non-technical trails) then you should gravitate toward the UltraFly 2. Sam: Close all around here. Flip a coin kind of choice as their heel feel is about the same. Upfront the Ghost is a touch firmer and more responsive. I do prefer the smoother fit of the 1080 upper. Jeff: Another no-brainer win for the 1080. The Ricochet is heavier, but it doesn’t feel nearly as good below the foot, and the upper doesn’t hold a candle to the 1080. The Ricochet reminds me more of the 1080v8, and that’s not a good thing. Sam: A worthy comparison. At almost exactly the same weight you get two different personalities here. Choose the New Balance is you want a softer more relaxed ride and one suited to easier days, but still a lively one. Choose the Vomero, hands down if you want a higher performance firmer but well cushioned faster training ride. They have similar fitting uppers with the Vomero 14's heel hold a bit more secure than the low 1080's. Sam: The 1080v9 has a superior upper especially in its mid foot hold where the Ride ISO is to unstructured and pliable for me at any faster paces. Underfoot while a touch less cushioned I prefer the Ride's faster overall feel. Jeff: Crazy comparison with more than two ounces of difference of weight, but the 1080 punches out of its class. The Epic React has a more fun ride, but anything over five miles I’d prefer the 1080. And while the Epic React upper is fantastic, I also prefer the 1080’s upper. Durability of the Epic isn’t nearly as bad as some fear, but there is no replacement for a high volume of rubber that isn’t going anywhere for hundreds of miles. Hope: I really like the Epic React for the bouncy ride and the way its upper disappears on my foot, but the 1080v9 wins out for me. Fresh Foam has more snap than React, at least in how it’s used in the 1080v9. Sam: React's ride and light weight make it a touch more lively but also without much personality. Disagreeing with Jeff and Hope, the Epic React's very snug upper mid foot hold down low, disagrees with me and very few shoes do that to me in that area. It is way to constricting and literally gets in the way of transition to toe off. Hope: The Sweet Road 2 is really sweet. It scored points with me for its flexible forefoot, lighter upper materials, and more confidence-inspiring heel lockdown. Nonetheless, the 1080v9 wins by a razor thin margin. The Sweet Road 2’s cushioning feels pretty heel-loaded — I’m reminded of (and this is an oldie, but a goodie) the Mizuno Wave Elixir 7. Great forefoot road feel, great flexibility, and most of the cushioning is in the heel. I do enjoy that snappy, connected feel, but more I think most runners would happily trade that for the smooth, consistent cushioning of the 1080v9 to have a shoe that’s comfortable for the long haul and still lively enough for some shorter, faster efforts. But why choose? Both are excellent. Factoring in price, the budget-friendly Sweet Road 2 would get the nod. Sam: I concur 100% with Hope. Hope Wilkes is a lifelong resident of Northern Virginia. No stranger to hills and humidity, this mid-packer is most at home on tough courses that might make other runners stay in bed. Hope has dabbled in ultras, including two 50-mile finishes, but has turned her attention to the marathon, working hard to improve upon her 2017 PR of 3:47:40. Already passionate about sneakers when she picked up running in 2008, it was inevitable that she’d become a running shoe geek. Hope funds her shoe habit with her gig as a financial services trade association program manager, a job that includes regular domestic and international travel. This happily married mom of two cats is also a first-year evening MBA student at Virginia Tech. In her free time she likes to review running shoes and gear at her blog Runner’s Reviews [https://runners-reviews.com/]. Jeff Beck is the token slow fat guy runner. Wasting his youth on such endeavors as playing golf and writing, he only started running in his thirties, and has a marathon PR of 4:15 to prove it. A full-time property manager, this part-time author and cold brew coffee maker lives in Phoenix, AZ with his wife and daughter. He enjoys running desert trails as well as the road, and is trying to get his 5K time to sub-twenty. Sam Winebaum is the Editor and Founder of RoadTrailRun. He has been running and shoe geeking for 45 years. As he turned 60 in 2017 he was thrilled to clock a 1:35.24 half and as he turned 61 a 3:40 marathon to qualify one more time for Boston. Sam runs his roads and trails in coastal New Hampshire and Park City, Utah. How do these compare to the FF Beacon? Those were the sleeper hit of 2018 for me! Agree Beacon is a fantastic shoe! Losing all the outsole from Fresh Foam made a big difference in weight (almost 3 oz) and ride. Other than Fresh Foam very different shoes. The 1080 for one has a full outsole so it is denser ride and not as dynamic light or fast but should prove more durable. It is what it is a protective durable daily trainer and if you are in the market for one and like New Balance it is a great choice. Stay tuned for our full review. I will definitely wait for your comparison with Brooks Glycerin 16 and Hoka Bondi 6. Very good review. How doesthe 1080v9 compares with the Brooks glyceryn16 and the Skechers go run ride 7. Thanks. First, Matheus, I think I'm the only one who has either reviewed or run in all three shoes, so here we go. Weight wise, the GRR7 is about an ounce lighter than the 1080v9, and the Glycerin 16 is about an ounce and a half heavier than the 1080v9. The Glycerin has the most plush upper of the three, and the roomiest toe box, and while I'm the first to admit I've become a toe box snob, all three are pretty good in that department. If you take out the insole of the GRR7 it becomes even more spacious. The biggest difference in the three is the midsole and the ride. I find the GRR7 squishy in a way that I don't completely love. I should log more miles in it with the insole removed, I think I would like it more - however, I don't think it is a slow shoe. Somehow they make squishy and responsive work together, but the best description I would give for the GRR7 midsole is low density. The 1080 midsole and ride is a little firmer, but substantially more stable. I could take the 1080 on a fairly technical trail and not have stability/fit issues. I wouldn't, mostly because traction is good but not exceptional, but you could. The midsole is very dense, and there's plenty of cushioning to last through a long run - but it also feels even more at home at an uptempo pace. Lastly, the Glycerin 16 is definitely the most lumbering of the three when it comes to the ride. It has a dense feel like the 1080, and is a little more plush, but doesn't feel nearly as goo when you pick up the pace. Of the three I prefer the 1080v9 by a mile. It surprised me just how much it was the perfect blend of cushioning and responsiveness. The GRR7 has a lot of potential, but I haven't fallen for it like so many other runners have. I like the shoe just fine, but in a year where so many phenomenal shoes have come out, it slips through the cracks for me. The Glycerin is a fine shoe as well, but with the creation of the 1080v9 I don't know where I would recommend the Glycerin. Yes, the upper is more comfortable, but everything else about the comparison leans to the 1080v9. One day the Glycerin 16 will become a casual/work shoe, and my feet will celebrate. One day the 1080v9 will wear out and no longer be in my running rotation, and my feet will mourn. Hope all that helps. For the two Anonymous readers asking about the 1080v9 and Triumph ISO 5, they are surprisingly different shoes. The previous generation the two shoes lined up perfectly (I literally cross shopped them in my LRS before buying the 1080v8), but they don't have much in common any more. Luckily, both shoes have gotten much, much better than their older brothers, but with more than 2 ounces in between them, they occupy a different space. The Triumph is a beast. It weighs a ton, the midsole material is super dense, giving good plush cushioning and support (and will last forever), and it has a very comfortable upper with tons of room up front. But the 1080v9 has all of that, but a little less in every way, and holds up much better at a faster pace. The 1080 midsole is dense, but not Everun level of dense, soft, but not as soft as the Triumph. Upper feels good, but the Triumph upper feels amazing, but the 1080 runs so much smoother, and still provides so much cushioning. Do you remember when Porsche brought out the Cayman, and a number of car fans thought it may have stepped on the 911's toes? That it did everything the 911 did, only scaled back just slightly, and in a much lighter package, for less money - and all that meant that Porsche beat themselves by making a better sports car than the 911? That's kind of what has happened here. If want a very heavy duty trainer to log a ton of easy miles in, then the Triumph ISO 5 is right up your alley. If you want anything else, get the 1080v9. I hate to say that, because the Triumph is a great shoe, but the 1080v9 is just that much better. One more question, I know you run in the New balance beacon. how does that compare with the NB 1080 v9 for cushioning levels (softer/firmer) versatility responsiveness, comfort, breathability etc. Do you have a preference between the two. Thanks S.
You are very welcome, glad you liked the car analogy. I would put the Epic React closer to the GRR7 than the 1080 or the Triumph. However, for every complaint I have about the GRR7, I'm the opposite with the ER, I'm a huge fan. It isn't as cushioned as either the 1080 or the Triumph, but it runs smoother for me. That said, I wouldn't go much over 10 miles in the Epic React (that's a me thing, I know folks who have run 26.2 in the Epic React), and the upper is finnicky - either it works for you or it doesn't. I don't think the Triumph or the 1080 have that issue, both of those uppers are top notch. I find that the Epic React is softer than the other two, but it isn't squishy like the GRR7, and it is very much at home when you pick up the pace. I've had no traction issue, and the exposed midsole as an outsole was a little concerning, but most of the excessive wear happened in the first 50 miles, after that it kind of leveled off. I would not do a tempo run in the Triumph ISO 5. 1080v9 or Epic React? Oh definitely, but the Triumph is a big shoe, and it really is bottom heavy. As far as the Beacon? I'd put the Beacon in a different category than the 1080v9, and I find it very similar to the Epic React. But, you asked about the two NB shoes against each other, so here goes. The uppers are similar, and the leaked shots of the Beacon 2 looks like mostly an upper change, to something very comparable to the 1080v9. While I have nothing against the Beacon upper, it feels very good, it's supportive without being overly complicated (the lack of extra overlays is a big reason my wife champions this shoe - and she does. The Beacon is her everything), but the 1080v9 upper feels better. Definitely feels more premium, and more secure through the midfoot. Yes, I had heel slip issue with the v9, but a runner's loop and it was fixed, so not a big concern there. The Beacon is a softer shoe under foot, and the 1080 is much more substantial, and more dense. They both run pretty smooth, but personally I have a lot more confidence in the 1080. If I had a 20 mile run ahead of me, I'd be defaulting to the 1080 (and maybe considering the Triumph or Topo Ultrafly 2), whereas the Beacon has a 10K to 10 mile max for me. However, and I'm not alone in this, the Beacon is a fast shoe for me. Every single time I've put the Beacon on for a run (envisioning a slow easy run since it does have lots of nice, soft cushioning) I end up going faster than anticipated. Not out of my mind fast, but I've set a few segment PRs around my neighborhood without even realizing it. I hope that answered everything, but if you have any more questions, fire away. I'd agree with your assessment of the Glycerin 16 and Pegasus 35. The G16 is the best Glycerin they've made, and I can come up with a dozen superlatives, but responsive wouldn't be early on the list. It's not sluggish, but it really isn't made for quick miles. The 1080v9 is not stiff when you start running in it, but if there is a seam that rubs you the wrong way, that's the ball game. I haven't had that issue, but we're all an experiment of one, and if it doesn't work for you, it doesn't work. It could just be a defect though, so perhaps worth another try on? The Epic React *is* faster and smoother to run in, but for me it doesn't protect the foot/legs nearly as well, so it has something of a ceiling distance wise over the 1080v9. Not to say it's the NB 1400 or similar, but it wouldn't be my first, third, or even eighth pick if I'm heading out for a 12 mile run. Agreed on the GRR7, I've definitely experienced heat issues, and I ran only a few miles in the Freedom, and would agree 100% with you. Very dense underfoot, but not really cushioned. The Triumph has the same density, but there's cushioning to spare there, and while the upper is different than the Freedom, it's also very nice. If you are thinking of picking up one shoe to be easy miles/long miles/recovery run, I'd really give the Triumph ISO 5 a shot. It is definitely softer and more cushioned than the 1080v9, and seems tailor-made for long slow days or recovery runs. While the 1080v9 can fit the bill there, it sacrifices some cushioning to also be happy when you turn up the speed a bit. I hope that helps, and if you have any more questions, fire away. Currently running in the Ride Iso which is a great shoe... just need more support, mainly for Achilles issues... I’ll still use Ride Iso but would like to try a shoe with more support & cushioning I.e 1089 v9 or Triumph Iso 5. I did not get a chance to test the Ride ISO (but did run in an earlier version of the Ride), but I know Sam has compared it to the 1080v9 in conversation. If support and cushioning are your top priority, I don't think you can find a better shoe than the Triumph ISO 5. 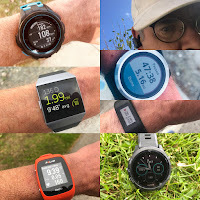 Overall I favor the 1080v9, but you seem to have that covered with the Ride ISO, and sacrificing some responsiveness for support and cushioning would likely be your best bet. Hope that helps, if you have any more questions, don't be shy. Great appreciate the quick reply!!! Forgot to mention I run from 10k to marathon distance & next year have committed to 2 ultras so by sounds of things, would Triumph iso 5 be the go to for the longer runs? You are very welcome, and spot on. I'd definitely recommend the Triumph ISO 5 for your long run shoe. At the very least, try it on and see how you like it, but I'm guessing you will. 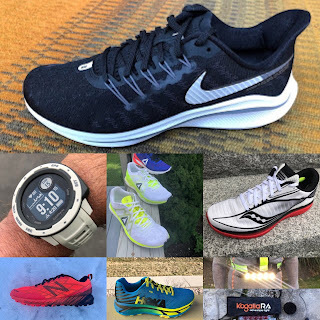 I raved about it in our review, but thought I would be alone in the praise since it is a very heavy and dense shoe, and the other reviewers are all much faster/lighter runners - but across the boards everyone who tested that shoe enjoyed it. Saucony outdid themselves with that update. A great help thanks, I am trying both models (1080, iso 5) tomorrow. I let you know how I go . Thanks S.
The ISO 5 is dense but plush in feel. The ISO 4 due to firmer and stiffer outsole, firmer rubber and 2mm less Everun is as you describe and as we describe not nearly as plush or easy to run. The sore feet are likely due to stiffness and firmness of the forefoot area and should be less of an issue. As far as ISO 3 I had it has slightly firmer and with a touch more response than ISO 4, again likely due to stiffness of ISO 4. Bottom line ISO 5 is an almost completely different running shoe than its two predecessors plusher, more flexible, and easier to move along. Thanks Sam,so are you saying the iso 3 is slightly firmer than the new iso 5 ? (if so that's good). ISO 3 was if I recall considerably firmer than ISO 5 is. And yes TPU based midsoles as ISO 5 has in a full unit is less temperature dependent than EVA. The Everun topsole I think being a minor factor. ISO 3 had an Everun heel insert plus topsole. It's review is here: https://www.roadtrailrun.com/2016/09/review-and-comparison-to-iso-2-saucony.html You will also note that ISO 3 weighed 10.5 due to mostly EVA midsole. I agree with Sam completely - 1080v9 for a versatile daily trainer, Triumph ISO 5 for recovery day plush ride. Please do let us know what you think, both great shoes, they just fill slightly different niches this year after being head to head competitors for a while. I'm with Sam here too, while the Triumph ISO 5 is very dense, it isn't really firm. They worked out the right balance of dense and plush, and it works really well. The newest Xodus, the ISO 3, is a full Everun midsole, is very dense, and I would put it more firm than plush - but with a gnarly trail shoe that's a good thing. The Triumph ISO 5 really is a revolution in that line, and it's my favorite Triumph at least since the 9, though in many ways its a completely different shoe than everything it shares a name with. I compared both in a shop today NB 1080 v9, and the saucony triumph iso 5, and did a couple short runs in each. I found the iso 5 very cushioned but a bit hard/firm on the heal area, but it had the best upper but it felt a bit heavy and a touch brick like feel underneath (they need to lighten the shoe and make it softer and more flexible). I found the 1080 v9 seems to transition quicker and smoother, its lighter and softer on the heel area for me. Did you find that? The heel hold wasn't as good as the iso 5 - which concerns me?. But overall for me, (which surprised me) the NB seem to be a more comfortable and lighter shoe to run in. I am leaning towards the NB 1080 v9 but wait as its full price at the moment. I'd largely agree with what you saw at the shop. The Triumph upper is fantastic (very definition of plush), though it is very heavy, especially underneath. I didn't find it firm or hard once you get into the run, just dense, though I do land more midfoot so my heel doesn't take that much of the brunt. I honestly was convinced when we reviewed that shoe I'd be the only one shouting its praises simply because of the weight, but everyone else liked it just as much as I did. I had floated the idea of a little bit lighter and more flexible, but really, they already make that shoe in the Freedom. The 1080 does transition faster and smoother, and it is much softer and the midsole is less dense, and overall much lighter. That said, it is the only shoe I have to employ a runner's loop in order to lock the heel down. I *never* have heel slip issues, but in this shoe I do. I'm writing this with one shoe on each foot, after running around the block a few times, and the extra density and weight of the Triumph disappear for me once I get moving. Standing or walking, oh yeah, it's a brick. I don't think it softens up much, but I do think you get used to it pretty quickly. I can't speak to the breathability of the 1080v9 upper as far as heat goes. I only started testing the shoe a month ago, and while Phoenix is warm, it isn't that warm. But it is far more responsive than the Triumph. Whenever I've picked up the pace in the 1080v9, the shoe has felt right at home. I really think the bigger question between these two shoes is more runner based than anything. Are you looking for one shoe that will do it all, or do you do all of your runs at the same pace? Or are you looking for another arrow for your quiver (or golf club for your bag)? If you want one do-it-all shoe, I don't think you can do much better than the 1080v9. It has plenty of cushioning for virtually any run, but still has the ability to go along for a faster run. The outsole has lots of rubber for durability and traction, but the cuts in the forefoot rubber allows the shoe to flex so you aren't running on a block of foam like the 1080v8. The upper is comfortable, and not necessarily spacious, but has enough room (and ability to stretch) to accommodate most feet. However, if you have a few shoes in your current rotation, and you are looking to add something that would excel for your long slow run, or lots of support for a recovery run, then the Triumph ISO 5 would be perfect. You have something else to throw on when you want to run a mid-length run at a faster pace, so you can lean into the heavy and comfortable (and super durable) Triumph. I'd also put the Triumph ahead if you've only been running for a year or so, and just have one shoe for every run, but every run you do is the same. If you aren't mixing up distances and paces, the Triumph would be right up your alley, but I'm guessing that isn't you. Just based on what you've said, I really think the 1080v9 is better suited for you. There are so many things going for it, and it sounds like the best attribute of the Triumph (its incredibly dense midsole) isn't something you are enjoying. Hi Jeff, Thanks for the feedback. I checked, and they only sell wide and extra wide versions of the 1080 v9 . I normally wear the normal/standard size version in the saucony so would that be an issue? I normally wear 11 in saucony, should I check out 10.5 or 11. I did notice as you said walking or standing with the saucony it felt like a brick but running it was far better. However I would be both running and walking with the shoe - so comfort is a big issue. I definately leaning towards the 1080 v9 and will go try them one more time. The 1080v9 is similar in cushion to the Solar Boost with more bounce and a more clear snappy response from the Torsion plastic embedded. It's front upper can be challenging as it combines a not very stretchy narrower soft shell toe box with a a rigid end of lace holder. I prefer the 1080v9 because of the upper issues with the Solar. We will soon have a review for Solar Drive which while heavier than 1080v9 has a very accommodating upper. It would be very good walk/run shoe. I suggest you order shoes to try through our links to Running Warehouse. They have fast service and easy returns and RTR receives a small commission on sales to help our work. Thanks for considering. 1080 is less responsive than Solar. Their bounces are different. More pronounced in Solar. The key is to make sure Solar Boost upper works for you. Thanks for your patience with all the questions and input this year. With your input I bought 3 running shoes this year and recently added a few mods that made the shoes even better for me. They are the skechers go run ride 7's, I put a a few skewer holes in the upper so it breathes a lot better in hot weather. The New balance beacon, which I love , I added in a softer thicker insole with and a small heel insert so its more like 8-10 mm drop, seems to feel more cushioned and yet maintain that fast feel for a daily trainer. And lastly the Nike epic react, I stretched the restrictive mid foot upper by carefully heating with a hair dryer and it no longer has that restrictive midfoot feel - it now transitions better. I am still looking to possibly adding the New balance 1080 v9 next year as a daily trainer. I hope you do a section on what you think are the top running shoes for each category for 2018. Thanks so much for your kind words. We'll keep at it here at RTR! Your mods are excellent and each addresses issues I had with those shoes! We are working on our year end articles now. Jeff Valliere's for trail is already up. Wishing you and yours a wonderful Christmas and Holidays and a healthy 2019 with many happy miles. Thank you very much for the kind words, we truly appreciate it. I'm glad you appreciate our particular, and varied, styles of comparing shoes. We're all an experiment of one, so getting a multitude of opinions is really helpful. I'm with Sam, great shoe line up and even better mods to each shoe. I may add a few holes to my GRR7, at least before things heat up (in Phoenix that's mid-late March). I really think if/when you pick up the 1080v9 you won't regret it, and outside of a runner's loop you might not need to do much to that shoe. What insole did you add to the Beacon? I'm a fan of my pair, but making that shoe *better* is always a good thing. And yup, plenty of best of the year pieces coming. I have a few more runs planned before I can completely nail mine down, but when it hits in the next few days I think there's going to be some surprises. Merry Christmas and happy holidays, here's to an even better 2019. The insole from the beacon was to thin and I was getting to much road feel so grabbed the insole from my old asics dynaflyte shoe which is especially thick near the forefoot, I think the 1080 v9 is the same kind of insole - so that might work Jeff. You can also heat up the skewer in the flame but it can leave more of a permanent mark (black ring around the hole) on the shoe. Just went for a quick short run in my old saucony triumph iso 3 this morning, its so slow and heavy compared to the beacon and react, run was 2 minutes slower for 2 kilometers, it felt like a tank compared to the other two - great how the running shoes are developing - lighter and faster. My two best shoes this year beacon and epic react, with Skechers GG7 a close third. My worse are the ultraboost, to unstable for running great for walking. Have a great christmas. Thank you very much! I have been working on it, and it'll be done very soon. There are a couple eleventh hour contenders that are throwing a wrench into everything. It's been an amazing year in running gear. Looking forward to your recommendations. The more I run in the beacon the more I like it, it can go fast, faster than my Nike epic react. I put a softer bigger insole with a heel insert which makes it more like a 8-10 mm drop -it now like a more general fast trainer. Did you try the new Nike Vomero 14's - did you like them . Interesting on the insole swap, I may give that a shot, but already really fond of the Beacons. I didn't test the Vomero, but I'm very intrigued by it. It's on my personal short list to check out in 2019. Wrapping up my best of list tomorrow, nothing like a little procrastination! I have been reading everyone's best of 2018 on here, it looks like the beacon is very popular. Christmas time you allowed to procrastinate a little :) The Nike Vomero 14 isn't out yet over here. Looking forward to your best of list. I have loved reading your reviews on various running shoes and have even made some purchases based on them (ex. - Skechers Ride 7-just ordered). However, I really start to doubt what I am reading when you compare the Nike Pegasus Turbo (which I own) with the NB 1080 v9 (have not owned any versions but have tried them on at local running store). How is that possible? I consider the Nike Peg T to be a faster paced training or even a race shoe for a larger guy like myself (6'0", 215 lbs, 56 yo) who is in pretty decent shape but not a fast runner by any stretch. How is the 1080 v9 which is almost 2 oz. heavier (or more) and generally considered a daily neutral trainer even in the same conversation? Please let me know if I am missing something with this NB shoe. Please?!? I run in the Peg 35 which I like a lot and also the Peg 35 T but feel like I need some more cushion on some days which is why I was looking at this review. It os also why I just ordered the Ride 7 so have not received them yet. Any other recommendations? Should I try this if I am looking for more cushion compared to the Peg 35 and T? I think it comes down to the old "different strokes for different folks" mentality. I touched on it briefly in my gear of the year post - my former track/intervals shoe is what fast runners use for a full marathon. The Pegasus Turbo feeling overly soft and not very stable compared to the 1080v9 is how Sam, Hope, and myself saw it, but how a shoe feels may be the most subjective opinion out there. For what it's worth, after your comment came in I put one on each foot and just went up and down the block in the dark, and weight-wise they feel very close. 2 ounces isn't nothing, but its also not that big of a variation. I know I've gone down the rabbit hole of weighing shoes and forming an opinion before I started running in them (I literally have a folder in my phone called shoe weights), and I think it has helped me miss the forest for the trees. The number on the scale matters far less than how it feels on my foot. And the Peg Turbo vs 1080v9 weight wise feels very similar. The Peg Turbo is much squishier, while the 1080 has a more cushioned and firmer feel. I think the uppers feel very similar, albeit the 1080 has just a touch more room around the toes, and to me, that makes all the difference. Personally, I think the biggest part of the disagreement comes from our assessments of the Pegasus Turbo, not how it relates to the 1080. The Peg Turbo has been one of the most divisive shoes I've seen. You and are off by about twenty years, but we are very similar in body type, so I'd venture to guess we're somewhat similar runners. However, I don't think of the Pegasus Turbo the same way you do. It feels like a medium-lightweight daily trainer that can be used at faster paces, but is much happier on easier days. I know at least ten people think I'm insane for that, and they swear its designed for fartleks or tempo runs. It's a divisive shoe. Back to your questions though - the GRR7 reminds me quite a bit of the Pegasus Turbo, in that it is a similar level of squishy but not necessarily well cushioned feel. I know I'm in the minority there, and so many folks love the GRR7. I wish I was one of them. I really do. I like liking things, and I know every single shoe we review was created with a lot of care and passion, and dunking on a shoe because I don't like it gives me zero joy. But if you like the Peg Turbo as an uptempo or race shoe, you may absolutely love the GRR7. However, I really think the 1080v9 is worth the look, because it is not divisive at all. I don't know anyone who's logged miles in it that didn't rave about it. Luckily RunningWarehouse has a great return policy, so you could always give a good shot. I hope that helps clear things up, let me know if you have any other questions. Thanks! I really appreciate your response! I agree that the Turbo is squishy but also had some pretty good ground feel, at least for me. My problem is I always want to run faster in the Peg 35 and the Turbo. I am almost looking for a shoe that will slow me down but still feel moderately cushioned and a little responsive. I bought the GRR7 from RW so it's all good if they are too much like the Turbo and I want to return them. I am starting to think that the 1080 v9 might be worth trying. For reference, I LOVED the Vomero 12! Similar to what you mentioned - it didn't feel like a heavy shoe or even a 10 mm (or 12?) drop to me - it just felt like a very well balanced shoe. I bought the Vomero 14 but do not like it for running so it my casual shoe (I think I am in the minority there!). So, if you have any other suggestions for a WELL BALANCED daily trainer to rotate with the Per 35 and Turbo please do let me know. I will let you know if I try the 1080 v9. Hi Jeff. I don't like NB fresh foam a lot. I have a zante v4 and I think it's too firm. That's why I'm afraid buying the 1080v9. I want a soft slow paces daily trainer. Do you think that the triumph is better than the glycerin 16? Wich one is softer? Have you tried the vomero 14? Is it softer than triumph and glycerin? I'd agree with Sam here. I wouldn't base your experience with Fresh Foam in the Zante v4 as a basis for how the 1080v9 rides. NB is doing some interesting stuff with Fresh Foam, and the new 1080, as well as the Beacon, are great examples of what they are doing with it. I never ran in the Zante v4, but I did put some miles in the v1 back when, and I wasn't a fan. It did nothing for me (don't tell my wife, it's her number 1 all time shoe), and if you told me the Beacon and 1080v9 used a completely different midsole foam, I'd believe you. I didn't run in the Vomero 14 (yet, on this year's short list) but regarding the Triumph ISO 5 vs Glycerin 16, I'd take the Triumph for what you are asking. The Glycerin is a great shoe, but the Triumph leans into it a little more. Slow, easy miles are better in the Triumph than the Glycerin. The Glycerin is a solid every day trainer, but I don't think it is as plush as the Triumph. If you want one shoe for absolutely every run, the Glycerin would probably be my pick there, but if you want recovery shoe or long slow run shoe, I'd go Triumph. Meanwhile I'd say the 1080v9 is similar to the Glycerin, in that it'd be great for every run you do, and I'd pick the 1080v9 over the Glycerin, but the Glycerin is a little more plush, while the 1080v9 is more responsive/sporty. Thank you both. Helped a lot! You aren't wrong, the v9 toe box is a little more narrow than the v8. That said, the material of the v9 toe box stretches pretty well to accommodate a wider foot. I favor Topo/Altra width toe boxes, and I went with a D width in the v9 and have no issues. If you normally rock a 13W, I'd think that size would be fine in the v9. After the great experience with the Beacon, I decided to give the NB1080v9 a try to replace the Bondi 6 which I have lots of problem with for long distance slow run. No heel slip with runner's loop. The ride is firm, but it is comfortable and stable. Lots of cushion in the midfoot area. It is not light but it doesn't bother me too much after i get going. So far so good. Do you have an ETA on your review of the Zanta Pursuit?